Texas Ranger Duncan McMurray fears that Emily, Rose, and Beth, the three cousins with whom he grew up on Whispering Mountain Ranch are headed for spinsterhood. Forced to play matchmaker, he selects three men to visit the ranch and court his cousins. When Duncan joins a vastly outnumbered force of Rangers on a mission to destroy a band of cattle thieves headquartered just over the Mexican border, his friend Lewton Paterson, a mongrel gambler with a dream of family and a respectable life, takes the place of a blue-blooded suitor. Emily McMurray, who still carries the scars of life before she became a McMurray, has no interest in the strangers visiting Whispering Mountain. She persuades a friend to take her place and disguises herself as Em, a tough ranch hand devoid of feminine wiles. To Lewt’s surprise, he finds himself more interested in the unsociable Em in her masculine garb than in the three lovely McMurray sisters. Humor and pathos blend in the retreat-advance-retreat moves as these two characters come to know one another. Duncan’s adventures in Mexico are interwoven with the story of Em and Lewt. Unlike Lewt, Duncan is the classic Western hero, a man of honor, courage, resourcefulness, and a deep love for his home. When he finds himself wounded and helpless, the dangers he confronts are real. I expect that we will learn more about him and the mysterious woman-child he befriends in a later book. When news arrives at the Whispering Mountain that Duncan has not returned from Mexico with the Rangers, Lewt and Em, who can ride and shoot as well as any man, join the rescue mission to bring Duncan home. On a journey filled with danger, passion, and revelations, Lewt and Em learn to trust their hearts and their dreams. The mix of toughness and vulnerability that characterizes both Em and Lewt makes them sympathetic characters. Em’s distrust of men and Lewt’s sense of unworthiness have roots deep in their respective childhoods, and watching their relationship move from prickly strangers to cautious friends to lovers will delight readers. The ending did seem rushed to me. I liked the conclusion, but I felt that I arrived there too soon. The speed with which the story moved from rising action to unraveling was disconcerting. This feeling plus some secondary characters who served little purpose kept the book from being a five-star read for me. This is the fifth book in Jodi Thomas’s popular Whispering Mountain series. It follows Texas Rain, Travis McMurray’s story; Texas Princess,Tobin McMurray’s story; Tall, Dark, and Texan, Teagen McMurray’s story; and The Lone Texan, Sage McMurray’s story. Fans of the earlier books will enjoy seeing Duncan (Duck, the boy from an outlaw camp adopted by Travis McMurray in Texas Rain) and Emily (the eldest of Jessie Barton’s three daughters who won Teagen McMurray’s heart even before he married their mother in Tall, Dark, and Texan) all grown up. But it’s not necessary to have read the first four books to appreciate this one. Thomas provides the details readers need about Emily’s early life, and the novel works well as a stand-alone. Texas Blue is the same kind of emotional, high tension tale as the first generation books. If you like Westerns, you’ll fall under the spell of the McMurrays and their Texas land. If you’ve never tried a Western romance, this book might be a good place to start. I’m hoping this will be the first in another McMurray quartet. I’m not only eager to see Duncan get an HEA, but I want to know what happens to Emily’s sisters. The cover of Texas Blue is gorgeous. I can't wait to read it. I love reading westerns and have been hooked on them for some time. I love the cover of this book its beautiful and I love Jodi's books. I can't wait to get this one. Thanks for the chance to win. I love westerns! Back when I first started reading romance, I always was drawn to anything if it had the word cowboy, rancher, lawman in the blurb! Can't wait to read it! As usual I find the clearest review of a book on The Romance Dish. I always compare reviews, and find those on this site have the best overviews of the books. I had the impression before reading this that Duncan's story was complete in this book. It seems it may be the tie that binds this series together. Sounds like another good book by Jodi. I look forward to reading it. 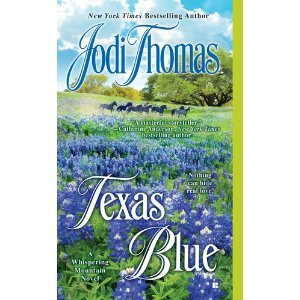 I love a good western and I have heard lots about Jodi Thomas's books i really need to add these to my must have list.